What is a Project Kick Off Meeting? The project kick off meeting is the first time that the client or stakeholders team meets with the team members which will bring the project to fruition. The meeting takes place after the scope, price and schedule (with a High Level Plan) have been agreed upon between the client and the pre-sales team. Key elements of a project like a scope, timeline, schedule, and risks should be presented in the first part of the meeting, as they are the basis of the project and will serve as the baseline throughout its lifecycle. What is the purpose of having a project kick off meeting? As stated above, the meeting is the first official meeting between the team members and the client (either internal or external). This short meeting is an excellent opportunity to agree on the outline of the project and to generate a personal connection between all involved. The kick off meeting also ensures that everyone involved, in the project is on the same page for all the key aspects of the project. The meeting is also an excellent opportunity to present thorough knowledge of the goals and the planned steps in reaching it, thus generating confidence and enthusiasm in the stakeholders. Since you don’t get a second chance to make a good first impression, having a successful kick off meeting is a crucial milestone in the projects’ lifecycle. How do you prepare for a project kick off meeting? Preparation: A brief presentation should be prepared by the team, which will present the goals and steps in getting there. The presentation should also make sure that all the team members are on the same page, and offer a unified front vis-a-vis the client. Creating working relationships: Getting to know one another, preferred methods of communication, knowledge, experience, and background will help in communicating effectively throughout the project. This is crucial in the success of any project. Presenting: The meeting should take place in one location, and it’s preferred that all the attendees will physically be in the same room for this. If this isn’t possible, then right virtual conferencing equipment is required. Once the main presentation is completed, it is a good idea to split up into more intimate groups for further meetings. This will generate good working relationships between the various team members. Video Conference: This method allows all the participants to see each other, view documents / presentations together and converse one with another. This method is a good choice if the team members are located in different countries, and is much cheaper than flying to one location. E-mail: This is a good method if the project is an internal one, of small scope and short. Since all of the stakeholders know each other, they don’t need to meet each other. Furthermore, since it is a short project organizing a meeting will take up valuable time. It much more efficient to send out an E-mail with all of the details, timeline, and scope. Further details in section #6 in this document. Meeting: This is the preferred method if the stakeholders and team members don’t know one another. There is no alternative to sitting in the same room and conversing live with new colleagues. Shared site: This is similar to the E-mail method above, but the only difference is that the info needs to be “pulled” by the stakeholders since it won’t be sent to them. The info can be uploaded to a shared site (such as a SharePoint site). Who should attend the project kick off meeting? How to draft an effective kick off meeting agenda? Keep it high level: The first slides should present an overview of the projects’ goal, the vision of achieving it and high level timeline. Work plan: Present a high level work plan, split into teams. This should display only the task and start / end dates. Define measurements: Clearly define how the success of the project will be measured along the way and in its conclusion. The frequency of measurements should also be defined. Review potential bottlenecks & risks: Pull together a high level list of the potential bottlenecks and risks of the beginning of the project. 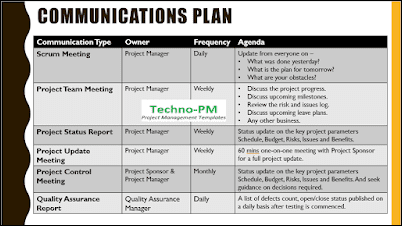 Methodology and communication: An outline of the methodology and communication plan should be presented, which can be used as a baseline for the various teams. Each team can tweak them if agreed by all the parties. R&R: Present the TL’s, main stakeholders and management team. Lifecycle: Present the entire projects’ lifecycle in a high level format. Questions: Leave ample time for questions and to raise concerns. Use a presentation/template or any other document to ensure you have a proper agenda. Consider printing out handouts for the participants with a few high level bullet points and main stakeholders. The exact agenda of the project will vary from project to project and also depend on the organization. In this article, we will look at a sample for a typical software development project. 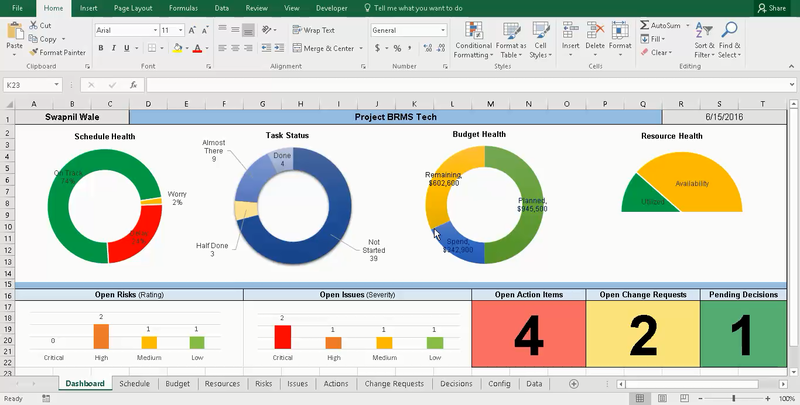 This is the first section in the kick off meeting template and the goal of having this it to give a high level view of the project and its purpose/benefit to the business. The information on this slide should be precise and having them in bullet format will make it readable. The slide may contain a project start date and end date, teams involved within the business and include the sponsor name or department. Similar to the introduction of the project the project deliverable should contain information about what the project will be delivering. Again keep it high level. It is important the project team is aware of the team structure and there is no better time than doing it in a kick off meeting. Generally, IT teams are well structured and there is always clear hierarchy but it is still a good practice to have the team structure documented and circulated. 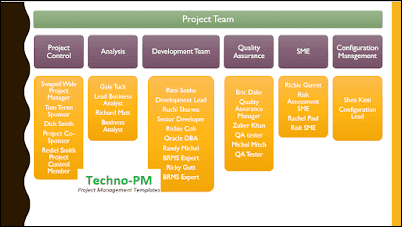 In the example below we have project control, analysis, development, SME, and configuration management teams clearly defined. Providing this information in the kick off meeting ensures that people know whom to go when there is an issue or question. Visibility of the team structure plays an important role in making the team communication effective. 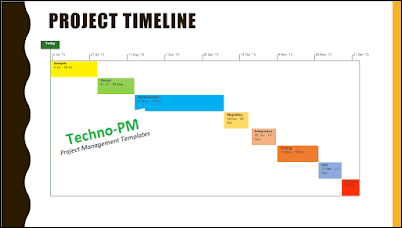 The project timeline helps the team to understand the project delivery time frame. The timeline in the kick off meeting should be for high level phases. Adding too much detail can cause confusion within the team and can cause communication issues. 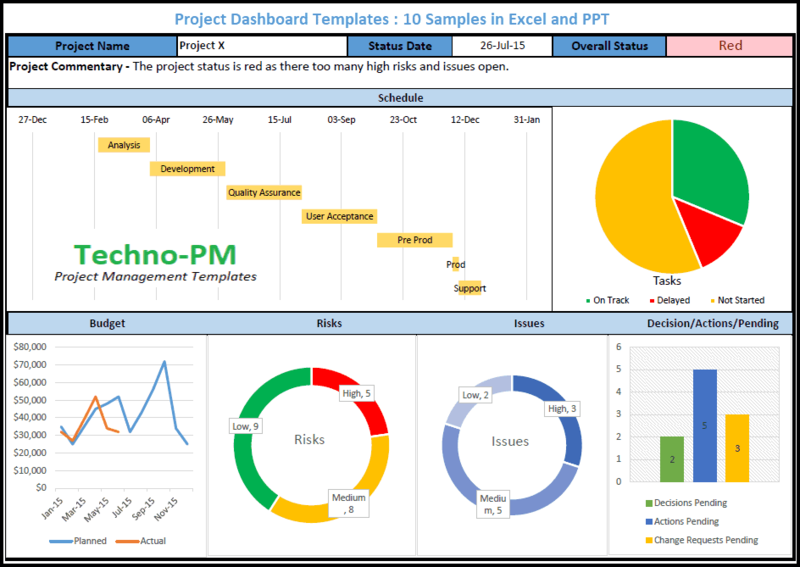 You can use a simple Gantt ( template with a representation of projects tasks against a timeline) or fancy excel timeline or even a set of dates may work. 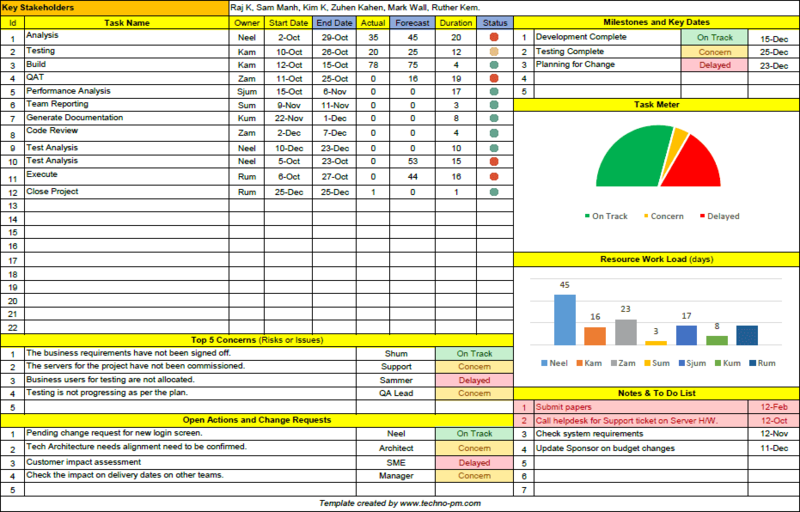 Try and highlight the key milestones in the timeline so that the team will be aware of them. Managing communications or comms is a difficult task as not everyone communicates in the same fashion. 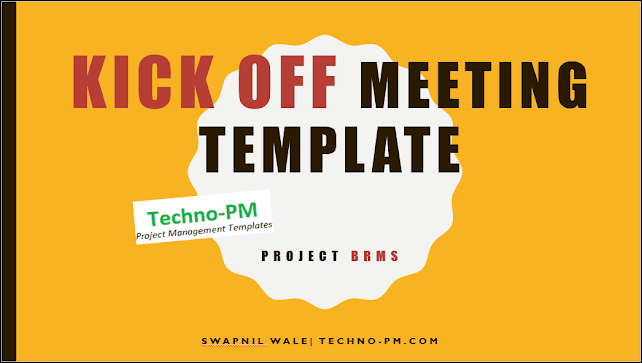 The kick off meeting is an excellent opportunity for the project manager to set the expectations about how the project team should be interacting with each other. In the below image and in the template there is a sample plan as to how the project team, stakeholders and business departments will be informed about the project activities. Common examples are Scrum Meetings, Project Team Meetings, Project Status Report, Project Update Meeting, Project Control Meeting, and Quality Assurance Report. 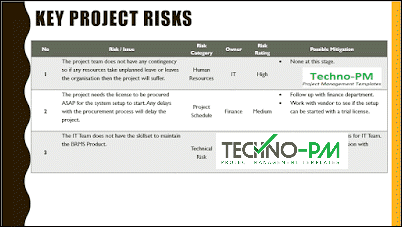 Before starting a project it is important that all the stakeholders are aware of the key risks within the project. Project Kick Off Meeting is a good opportunity for discussing the risks that can affect the project. Do not include all the risks. Only include the key or major/high risks. Each risk should have a description, category, rating, owner and possible mitigation. It is possible that during the kickoff meeting the team may come up with new risks which were not discussed before. No matter how small or big the project there will always issue and you always need someone to be accountable. The kick off meeting is a good opportunity to detail this. The escalation and technical contacts in the kickoff meeting template will explain how the team should communicate when there are issues. It also explains how the information about issues and escalation will be communicated all the way to the project control. 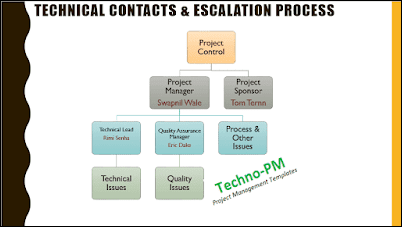 Typically the teams escalate issues to their respective team leaders which are then escalated further to the project manager. The project manager in conjunction to the sponsor may decide to get the project control involved. The project closure terms are the conditions which need to be met for the project to be closed. The closure terms need to be drafted carefully as they can be very political. Small grammatical errors can lead to lengthy delays in closing the project. The project closure terms should be a bullet item list. The project documentation should contain information about documents related to the project like Project Plan, Business Case, Risk Management plan etc. The kickoff meeting should not be booked for more than 60 mins. Set an expectation that the plan and other details may change. The Key reason for this project kick off meeting is to make everyone aware of their role and tasks. Invite all the key stakeholders from business and project team members to the meeting. Dry run your presentation and agenda with project sponsor and some senior team members before the actual kick off meeting for feedback. Circulate the soft copy after the meeting so that people who missed the meeting can read. You can get most of the content from Project Proposal, Plans and Risk Management Plan. Do not get into detailed discussions around scope, delivery or risks in the kick off meeting. Be open to feedback as the team can suggest better ways of doing things. Take a few hard copies of the presentation to the kick off meeting in case of projector in the meeting room does not work. Decide on the method: Once a decision has been made, it is very important to take all the necessary measures to ensure that the meeting will go as smoothly as possible. This includes making sure that back-ups are in place (UPS for the electricity, a spare projector, extra chairs are available, etc.). The following steps assume that the chosen method was a meeting. Invitations: Send out the meeting invitation well in advance, to allow people to make travel arrangements if necessary. Consider booking an off-site venue: This will take the participants out of their normal routine and help them focus on the kick off meeting. Agenda: Decide on the agenda, and send it along with the meeting invitations (More on this in the following chapter). Timeline: Ensure that the venue has some sort of stopwatch, in order to help the participants to stay within their allotted time. The agenda should clearly state how much time each speaker has. Presenting: Ensure that the venue’s audio & video equipment is compatible with the computer which has the presentation on it. Also, make sure that a remote control (for the slideshow) and laser pointer are available. Whiteboard: A place to write down any tasks or allow the presenter to visually explain a point is a good idea to have. Breaks: It is hard to maintain focus for more than 90 minutes at a time, so schedule breaks every now and then. Ask the participants to access their laptops / cell phones only during these breaks. The breaks are also good for creating personal connections. Also, schedule a long break for lunch / dinner. Contact list: Create a contact list, split into teams. This list should be distributed during the meeting (soft-copy). Assign one team member who will produce the MoM at the end of the meeting. At times you might not need a full-blown project kick off meeting. This is especially true if you are running a project which is small or an internal project. In such cases, the project manager has an option of using an email to kick off the project. The team members should appear in the “To” field, and the stakeholders (internal and external) in the “CC” field. The subject should be “ Kick Off”. The sender should request a read receipt from the entire distribution list. The E-mail should contain the following information – The Kick Off date, The goal of the project (the scope), The due date of the main tasks and milestones (timeline). The team members credentials (Name, E-mail address, Phone #, Title, etc. ), The means of measuring the project (KPI’s) and the frequency of communication. Links to public access sites (SharePoint for example) where the methodology, risks matrix, and all other official document are (or will be) stored. A few closing remarks thanking the pre-sale team who started the process, and wishing all the team members a successful journey.